Introduced as wagon series of Volvo S40 Sedan, Volvo V40 was launched for the very first time in 1995. 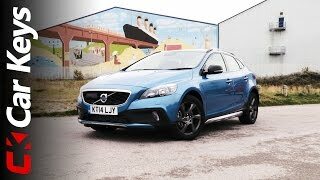 Invented by time is what we’ll call the modern and our car of day Volvo V40 Cross Country 2014. Blended with better looks and a fuel efficient engine this all new release is prepared to compete with the BMW X1. Now what is to be seen is its preparations and worth when it stands in market. 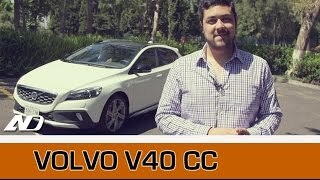 Let us have closer sneak to judge the all new Volvo V40 Cross Country 2014. Interior of Volvo V40 Cross Country 2014 is much of space concentrated with comfort too rolling the dices around through adjustable headrests on front and center rear seats upholstered in leather. Reason behind saying so is the massive space inside for five passengers easily and rear seats that hold an option to be folded if the back isn’t consumed and thus expanding the cargo space. Apart from these the ‘spacious’ queue carries its wings from glove compartment till the rear room. Starting with the cockpit, glove compartment is integrated with a penholder and space to keep two drinks and further keeping them cold through Electronic Climate Control System. More in the front is storage space provided under the instrument panel and below the armrests. The legacy continued to rear of Volvo V40 Cross Country 2014 with Parcel Shelf Net and space behind the seats. From technological point of view the updated infotainment and navigation system are an appreciable addition accompanied well by, wireless music playing, Bluetooth hands-free communication and LED lamps that adapt to the interior temperature. Talking about safety few major ones to come standard with model are Pedestrian airbag, pedestrian detection technology and City-Safety auto braking system. 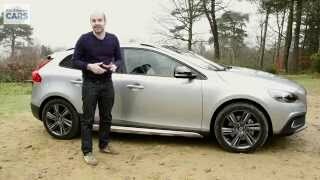 Speaking about exterior of Volvo V40 Cross Country 2014 we would like to proceed first with the front fascia. Front end of Volvo V40 Cross Country gets catchy through honeycomb mesh grille featuring ‘Volvo’ badge, dark bumper with vertical DRL-lights and elongated headlamps. These all together add perfect blend to this model in comparison to its siblings. 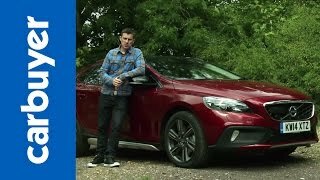 Moving to the rear fascia of Volvo V40 Cross Country 2014, your eyes might stuck upon a major add-on which we believe glued our attention and that’s the rear bumper with contrasting paint and an integrated skid plate. Adding more in the glory are the 19” Damara alloy wheels with diamond-cut rims. 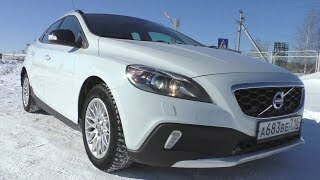 Volvo V40 Cross Country 2014 gets its power through Turbo T5 Petrol engine that delivers 245 hp and 350 nm torque paired to eight-speed automatic transmission. While company claims that with this new Drive-E powertrain fuel efficiency will increase they also share the dropped CO2 emission to 149 grams per km.